The Routledge History of Medieval Magic brings together the work of scholars from across Europe and North America to provide extensive insights into recent developments in the study of medieval magic between c.1100 and c.1500. This book covers a wide range of topics, including the magical texts which circulated in medieval Europe, the attitudes of intellectuals and churchmen to magic, the ways in which magic intersected with other aspects of medieval culture, and the early witch trials of the fifteenth century. In doing so, it offers the reader a detailed look at the impact that magic had within medieval society, such as its relationship to gender roles, natural philosophy, and courtly culture. This is furthered by the book’s interdisciplinary approach, containing chapters dedicated to archaeology, literature, music, and visual culture, as well as texts and manuscripts. 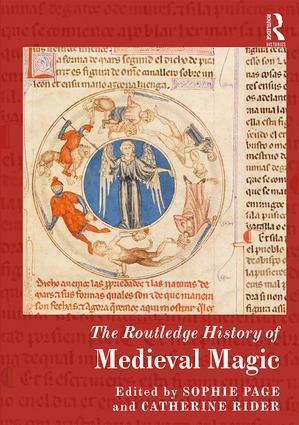 The Routledge History of Medieval Magic also outlines how research on this subject could develop in the future, highlighting under-explored subjects, unpublished sources, and new approaches to the topic. It is the ideal book for both established scholars and students of medieval magic. Sophie Page is an Associate Professor in Late Medieval History at UCL. She is working on medieval magic and astrology, especially in relation to religion, natural philosophy, medicine, and cosmology. Catherine Rider is an Associate Professor in Medieval History at the University of Exeter. Her research focuses on the history of magic in the later Middle Ages, looking especially at the relationship between magic and the medieval church.